Former two-time (lineal and WBO) heavyweight champ Shannon Briggs turned 45 in December, he has not fought since May of last year (a one-round blowout) and his critics say he should never, ever have fought again after the brutal 12-round hammering he took at the hands of Vitali Klitschko back in late 2010. “June 3rd I’ll be fighting @fastfres for the WBA regular title. He must fall. Three decades. Three time heavyweight champion,” Briggs, 60-6-1(53) wrote on his Instagram page. If Briggs could well be suffering from a touch of ring rust by June 3, Oquendo, 37-8(24) will be positively creaking. Having last fought in July of 2014 when he was closely out-pointed by Ruslan Chagaev in a vacant WBA heavyweight title fight in Grozny, Russia, Oquendo has boxed just six times since 2010. So, forget, if you can, about “Fast Fres” having done even less than Briggs has done to have earned a shot at a world title, wonder instead about how much Oquendo will have left come fight night. When on his game, Oquendo, who is rarely stopped (just twice in his long career, by David Tua and by John Ruiz) can be a tricky customer. If – and it could prove to be a pretty big if – Oquendo is in shape, his reflexes sharp, he just might give Briggs fits. Oquendo winning on points might not be a bad pick – but we just don’t know how sharp Oquendo will be in the fight. 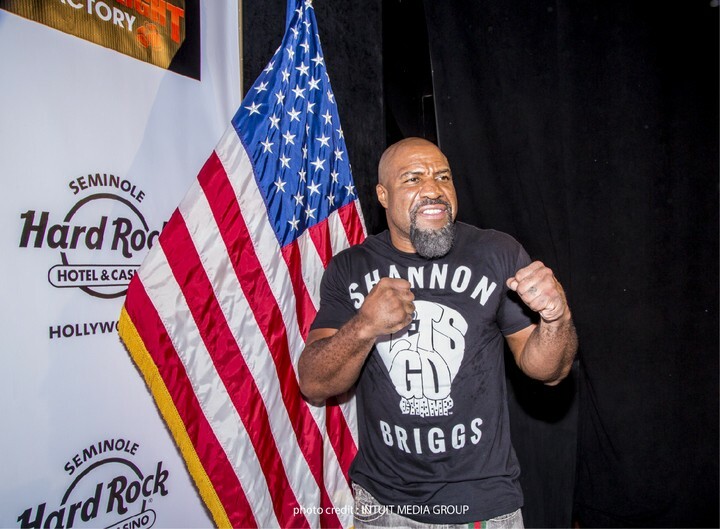 Most fans will be cheering for Briggs, as he has a far more exciting style and he has a great story to his name. Can “The Cannon” achieve his dream and make history as the very first heavyweight champ to have reigned in three separate decades? It seems we will soon find out. So what if the combined age of the two fighters will be 89 (and to think, they dubbed the George Foreman (aged 41) and Gerry Cooney (aged 33) fight “Two Geezers at Caesars!) – Briggs deserves one last shot at glory for all the fun he’s given us. It could be Oquendo who goes home with the strap, though.